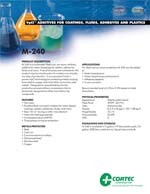 Description: M-240 is a multimetal, flash rust, corrosion inhibitor additive for water-based paints, sealers, adhesives, fluids and more. Free of silicones and surfactants, this product may be introduced to formulations at virtually any step of production. It incorporates Cortec’s proven VpCI technology for protecting metals ranging from steel to copper and most other commonly used metals. Designed for easy blending into the production process without unnecessary risks to personnel, equipment or other manufacturing compounds. Package: 5 gallon (19 liter) plastic pails, 55 gallon (208 liter) metal drums, liquid totes and bulk.